The second building to get ticked off the list is located just off Byers Road (see the map for the exact location), giving me a solid excuse to nip into the Grosevnor and pick up some of their brilliant sweet chilli popcorn! 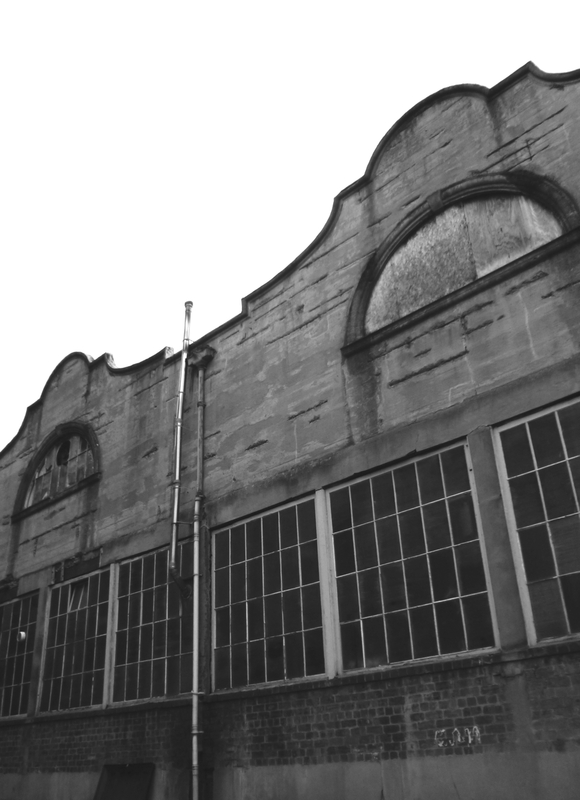 The Botanic Gardens Garage at 24 Vinicombe Street is the work of Glasgow architect David Valentine Wyllie, and the only one of his primarily industrial designs to be A-listed. 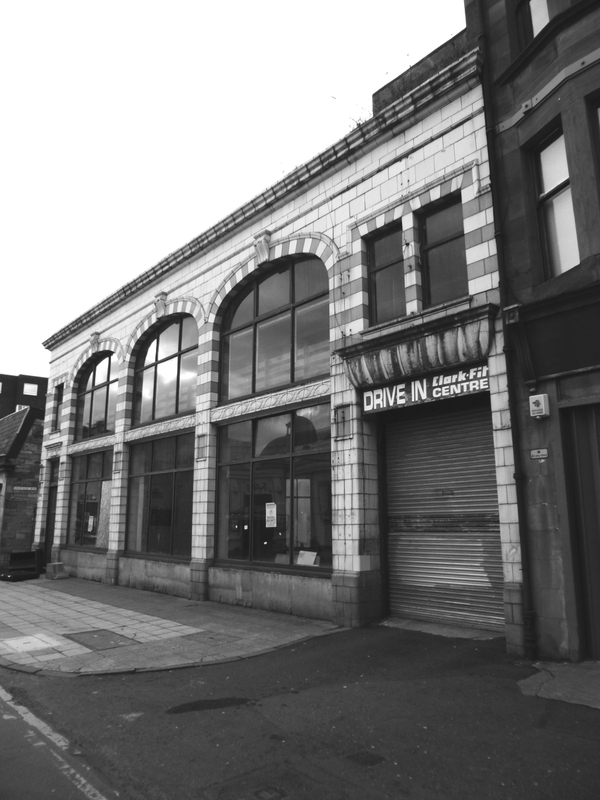 Constructed between 1906 and 1912 it is the oldest remaining purpose-built motor garage in Glasgow and, so far as can be ascertained, the UK. The building remained in use until 2007 by Arnold Clark and has subsequently been subject to a number of failed development bids, these rejected on the basis that they all involved some element of demolition of the original structure. 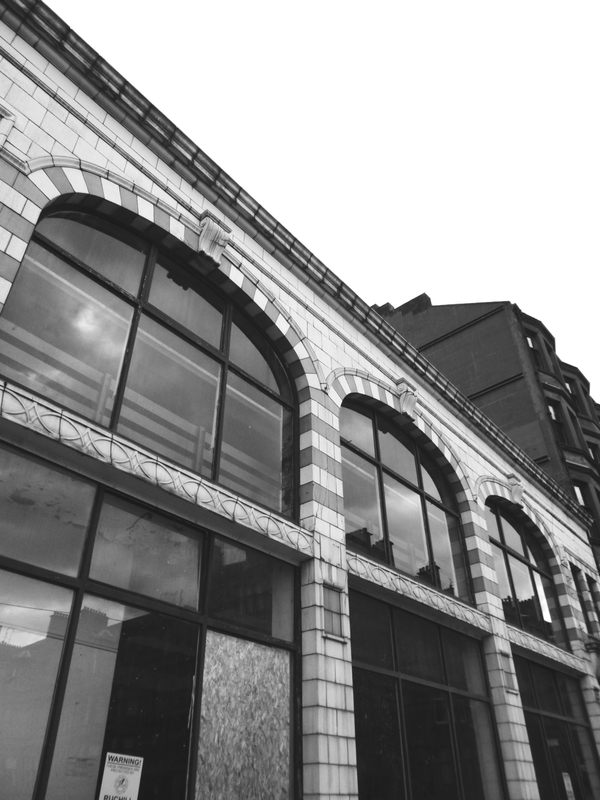 The Western Baths have also offered to purchase the garage and restore it to its original use as for parking for their also A-listed club on Cranworth Street, however Arnold Clark appear intent on pursuing a more profitable use for the site. To find out more about these bids see the website of the Save The Botanic Gardens Garage group, which is also home to a great collection of interior photos of the building. The client for the works was a Mrs Annie Kennedy, who had previously contracted DV Wyllie to design the tenement adjacent to the garage. The ramp to the upper floor was located in the pend of the tenement with access also available from the tenement first floor into the garage, this makes this building all the more unique as one of the first multi-storey garages in Europe. At the time of construction car ownership was starting to become more common among the wealthy (to put it in historical context the Model T was put into production in 1908) however on-street parking was not permitted necessitating the development of garages in densely populated and prosperous areas. The building fronts on to Vinicombe Street with a squat two-storey, 5-bay facade of green and white faience. The large expanse of glazing of the three central bays allows light to penetrate deep into the plan and would have shown off the vehicles stored and being worked on inside. It’s easy to imagine Glaswegian’s with their noses pressed against the glass looking to admire these new and, at the time, rare machines. Wyllie prepared elevations that show the building extending to a third storey, but this was never constructed. The architectural style of the building seems to be up for debate, Historic Scotland describe it as Italian Romanesque, the 20th Century Society say Beaux Arts, elsewhere most newspaper articles describe it as Art Deco despite it preceding the establishment of that particular movement by 20 years! Personally I think it is more baroque than anything else, it was certainly built during the Edwardian baroque revival and features typically baroque elements such as the Dutch gables to the side and rear elevations, the form of the arched windows with their articulated keystones is comparable to that found in Edwardian warehouses and industrial buildings, whilst the pattern of the faience can be compared to other contemporary baroque buildings such as the Battlefield Tram Shelter. The facade appears to be in relatively good condition, some cracking is evident in the tiles, the key stones being the main victims with all three showing fractures. Generally the main facade would significantly benefit from a good wash and the foliage being removed from the gutter behind the cornice. The painterwork to the door and window frames, along with the plinth course below the windows, has flaked significantly and as a minimum requires a decent rub-down and repaint. 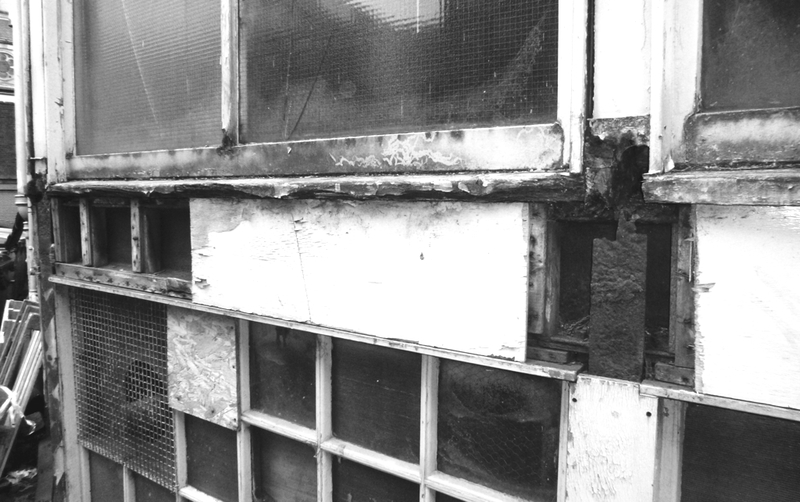 The side elevations are significantly more worse for wear, glazing has been damaged, the timber is rotting and evidence can be seen of badly rusted and delaminating steel work around the glazing. However, there is no sign of significant cracking to the brickwork or concrete suggesting that structurally the building remains relatively sound. The structure of the building is equally as unique as the facade. The roof of the building is supported by elegant steel trusses that spring from the floor below in a v-shape, whilst the upper side elevations are constructed from ferroconcrete. This reinforced concrete was built using the Hennebique method (also utilised in two other A-listed buildings, the 1907 Lion Chambers on Hope Street and what is now the Hillhead Book Club completed in 1913, which faces the Botanic Gardens Garage) and represents a particularly early example of the use of this kind of construction in Glasgow. This building is aesthetically, structurally and historically important in both a Glaswegian and international context, and as such more than merits it’s A-listed status. 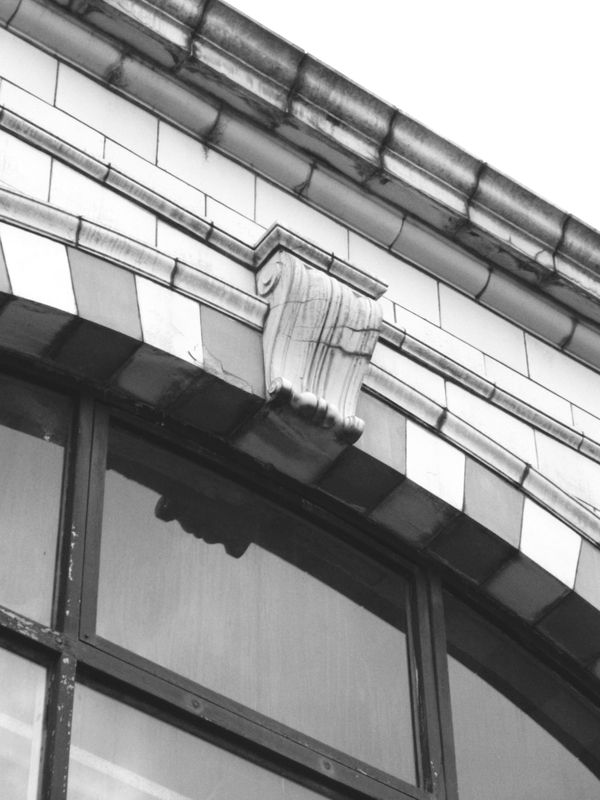 It has so far managed to stave off demolition thanks to a determined group of champions, and hopefully that desire to see the building restored to it’s former glory will eventually lead to action on the parts of the building owners. It is frustrating that a party who has a vested interest in letting the building decay and the cost of repair spiral can retain ownership of such an important building, whilst there are others who have volunteered to take the building on and bring it back to life. Interesting – but you don’t seem to have got your camera inside? How did cars get upstairs?